I think this is a book you could read every night before bedtime. It's a 'count and kiss' book. So, let's begin. 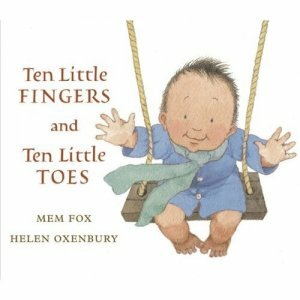 First you count and kiss all ten toes and then count nine kisses while you're kissing the feet. Who wouldn't look forward to bedtime when you get kissed and have so much fun getting there? Discover the engaging rhymes as babies from far and near gather to show their fingers and toes...and a kiss for the nose.